bring people together and unite the world by transcending language, cultural and regional barriers. the dreams of so many around the globe. Rakuten is proud to be the Main Global Partner and first-ever Global Innovation and Entertainment Partner of legendary soccer team FC Barcelona. Rakuten is proud to be the first-ever jersey badge sponsor and Official Partner of the Innovative Golden State Warriors. Rakuten is proud to be the Global Innovation Partner and Powered by partner of Spartan race, the world’s largest obstacle race and endurance brand. Since their founding in 2004 as Japan’s first new professional baseball franchise awarded in 50 years, the Tohoku Rakuten Golden Eagles have gone from strength to strength. Buoyed by the support of their dedicated fans in the Tohoku region and around the country, they won their first Japan Series Championship in 2013. In accordance with their motto of being “The Baseball Entertainment Company,” the Rakuten Eagles strive to deliver passion and inspiration through baseball. They have also had much success in breathing new life into Japan’s professional baseball industry, adding innovative leisure and entertainment facilities to their home ball park and incorporating new technologies such as virtual reality into their player training program. Rakuten's partnership with the Vissel Kobe professional soccer team is grounded in our belief that sport has the power to make life richer and more fulfilling. This power was borne out when Vissel Kobe became a symbol of recovery in the aftermath of the Great Hanshin Earthquake, which devastated Kobe and many surrounding areas in 1995. “One Team, One Family, One Dream - To become the No.1 Club in Asia”: The club slogan encapsulates a tradition of players, fans and the local community coming together to pursue a common dream. The Rakuten Japan Open is the nation’s largest tennis tournament, held every autumn at Ariake Colosseum*. Since 2009 it has attracted some of the world’s top players. Rakuten has continued to nurture the partnership, enhancing the event for both the players and fans alike. During the tournament, Rakuten invites young tennis players, giving them the chance to learn from some of the greatest players in the world. *The tournament will be held at Musashino Forest Sport Plaza in 2018. At Rakuten, we believe that music and the arts have the power to bring joy to people and create a better society. Based on this belief, we have been supporting the Tokyo Philharmonic Orchestra since 2011. With the longest history of any orchestra in Japan, the Tokyo Philharmonic Orchestra is distinguished not only for its active and varied schedule, embracing symphonic concerts, opera and ballet, but also its work in promoting cultural exchange through education and overseas tours. These qualities of tradition, excellence, teamwork and innovation are ones we admire and share at Rakuten. Rakuten GirlsAward is one of Japan’s largest fashion and music events. Held twice annually in spring and fall, the event aims to promote Japanese culture around the world. 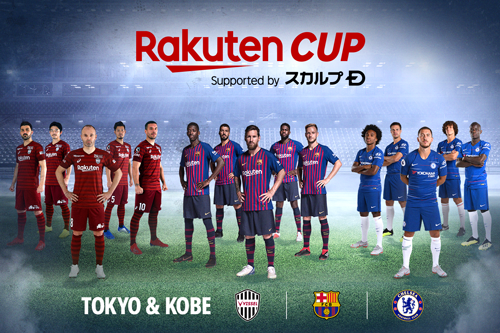 Rakuten has been the main sponsor since fall 2017. By creating synergy between the real-world event and various online services – for example, by allowing users to purchase clothes worn by the models – Rakuten plans to create an experience that anyone can enjoy.